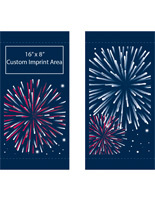 More Banner Size & Design Options Available! 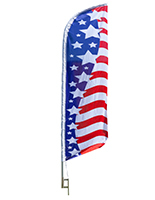 Patriotic Business Advertising From Flags to Prize Wheels to Car Bows — Get Your Red, White, and Blue On Year-Round! 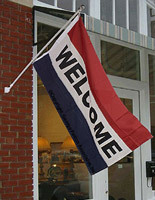 What’s an effective way to dress up your establishment’s entryway for the 4th of July or Presidents Day? 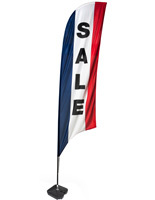 Our patriotic business advertising displays feature feather signs in red, white and blue for roadside storefronts. 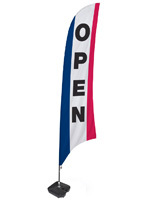 Place one of these outdoor swooper signs next to a doorway to entice visitors to come inside! 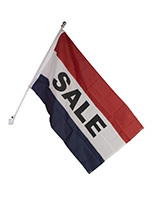 This selection of fabric signs are teardrop or quill-shaped. 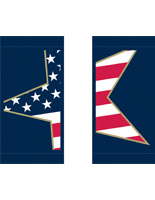 These flutter flags ripple in the breeze to draw attention from afar. 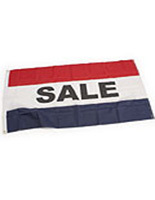 Our patriotic business advertising displays come with a wide assortment of pre-printed messages in bold black text. 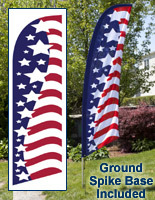 The high-contrast lettering against these red, white, and blue-themed advertising flags is easy to read from a distance. 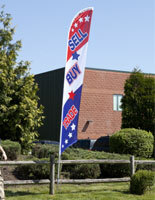 This flutter signage is designed to stay taut during windy weather so messages are always visible. 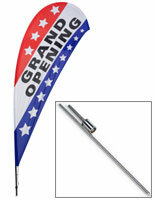 Our deluxe feather flags come with a convenient black nylon carry bag. 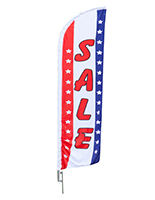 Whether you’re decorating your shop for Fourth of July weekend or welcoming visitors year-round, these patriotic business advertising displays, also known as red, white, and blue-themed advertising flags, draw visitors in from the curb. 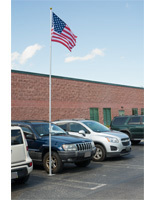 In addition to our feather signs, we offer traditional American flagpole systems. 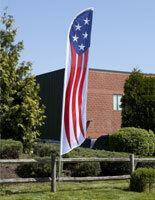 Fly stars the and stripes in the front entryway of schools, businesses and municipal buildings. 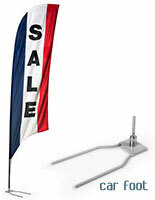 What red, white, and blue themed advertising flag base styles are available for displaying teardrop signage? 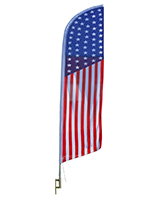 Some of our patriotic business advertising displays, outdoor feather flags have spike bases that are inserted two inches into the ground during months when the ground is soft. Hard plastic bases get filled with water so the banner display doesn't tip over. 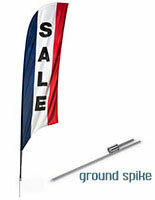 Lightweight and easy to transport, these portable flag systems are perfect for trade shows and expos as well. Cross-bases have a water bag and can be set up inside or outside. The slim profile of these signs only uses a small store footprint, leaving room for browsing customers, and displayed merchandise. Car foot-style metal bases are inserted under a car tire inside a showroom. Since they are rust-resistant, they are also suitable for outdoor use. 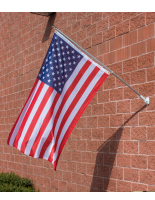 In addition to our swooper flags, we sell different sizes of the standard USA flag that business owners hang outside their shops to draw attention to them. 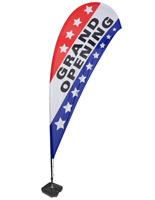 Our banners can also be mounted outside of schools and public office buildings. 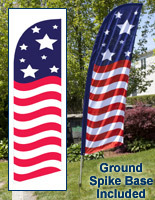 These red, white, and blue-themed advertising flags are year-round reminders of our patriotism. 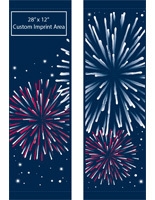 They lend a celebratory vibe to any shop or business environment. 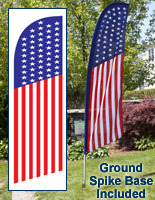 These flagpole kits come with a pole, flag, and mounting hardware. 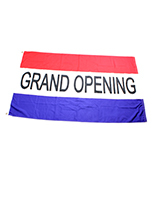 The banner is constructed of polyknit mesh with brass grommets. 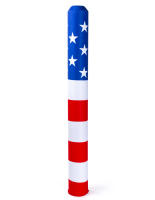 The poles are made of lightweight aluminum, an affordable alternative to fiberglass. An adjustable bracket tilts 0 to 90 degrees so the user can adjust the angle. 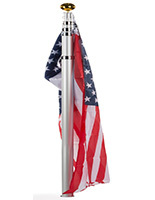 Each of the flagpoles comes in four pieces that can be knocked down and carried by one person. 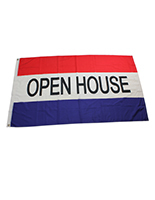 Most of our flags and banners with pre-printed messages are made of rugged polyester. The fabric is resistant to wrinkling, fading, and shrinking so they are a great investment. Others are constructed of double-hemmed, canvas-enforced nylon. 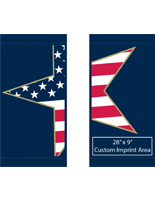 Our dye sublimation screen printing is a dyed-through process that displays the mirror image on the reverse side. 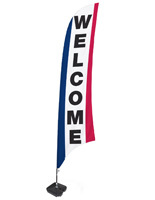 We have an array of different messages to choose from that pertain to real estate, car dealerships, and retail stores as well as generic "Open" and "Welcome" signage. 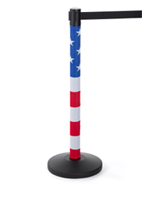 What patriotic accessories can be brought into a showroom to celebrate America-themed holidays? 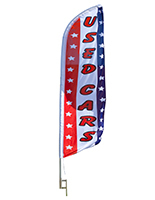 Celebrate the Fourth of July or Presidents Day by having a sale on red, white, and blue cars in the showroom! 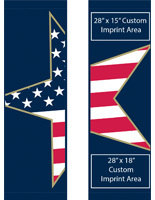 These metallic holiday car-bows feature a stars and stripes theme. They attach with a magnetic base to the top of cars, trucks, or boats without harming the paint finish. These glossy plastic decorations instantly turn big-sized inventory into gifts! Generate excitement around new products in your store around the Independence Day. Having a company team-building exercise off-site picnic in July? 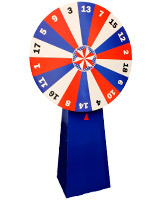 Our casino-style cardboard prize wheel has 18 numbered slots for custom write-in prizes. Create excitement around your brand! Fortune games bring people together at outdoor events like company picnics. Retailers use rotating prize boards during ad campaigns and new product launches. Our portable casino spinners are super affordable, lightweight, and easy to transport to events. 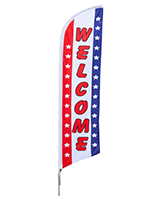 Beckon visitors from afar into your store with brightly colored flags and banners. 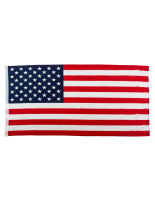 Show patriotism all year round by adding red, white, and blue to shop decor. 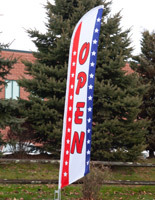 Grab customer attention from the street with inviting America-inspired signage and enjoy a sales boost!